The Chishtī Order (Persian: چشتی‎‎ chishtī; Arabic: ششتى‎‎ shishtī) is a Sunni Sufi order within the mystic Sufi tradition of Islam. It began in Chisht, a small town near Herat, Afghanistan about 930 CE. The Chishti Order is known for its emphasis on love, tolerance, and openness. The Chishti Order is primarily followed in Afghanistan and Indian subcontinent. 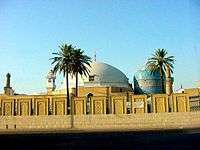 It was the first of the four main Sufi orders (Chishti, Qadiriyya, Suhrawardiyya and Naqshbandi) to be established in this region. Moinuddin Chishti introduced the Chishti Order in Lahore (Punjab) and Ajmer (Rajasthan), sometime in the middle of the 12th century CE. He was eighth in the line of succession from the founder of the Chishti Order, Abu Ishq Shami. There are now several branches of the order, which has been the most prominent South Asian Sufi brotherhood since the 12th century. In the last century, the order has spread outside Afghanistan and Indian subcontinent. Chishti teachers have established centers in the United Kingdom, the United States, Australia, Eastern and Southern Africa. The Chishti are perhaps best known for the welcome extended to seekers who belong to other religions. Chishti shrines in South Asia are open to all faiths and attract great crowds to their festivals. Chishti believe that this insistence on otherworldliness differentiates them from Sufi orders that maintained close ties to rulers and courts, and deferred to aristocratic patrons. Chishti practice is also notable for sama: evoking the divine presence Sufi's use to listening to Qawwali. The Chishti, as well as some other Sufi orders, believe that Qawwali can help devotees forget self in the love of Allah. However, the order also insists that followers observe the full range of Muslim obligations; it does not dismiss them as mere legalism, as some strands of Sufism have done. The Qawwali usually heard at Chisti shrines and festivals is qawwali. The Chishtis follow five basic devotional practices (dhikr). Early Chishti shaykhs adopted concepts and doctrines outlined in two influential Sufi texts: the ʿAwārif al-Maʿārif of Shaykh Shihāb al-Dīn Suhrawardī and the Kashf al-Maḥdjūb of Hudjwīrī. These texts are still read and respected today. Chishti also read collections of the sayings, speeches, poems, and letters of the shaykhs. These collections, called malfūẓāt, were prepared by the shaykh's disciples. Sufi orders trace their origins ultimately to the Islamic prophet Muhammad, who is believed to have instructed his successor in mystical teachings and practices in addition to the Qur'an or hidden within the Qur'an. Opinions differ as to this successor. Some Sufi orders trace their lineage to Abu Bakr, the first Sunni caliph, others to 'Alī ibn Abī Ṭālib, Muhammad's cousin, whom the Shi'a regard as the first imam. The Chishti, though Sunni, trace their lineage through Ali. This is not unusual for Sufi orders, which tend to stress devotion rather than legalism and sectarianism. The order was founded by Abu Ishaq Shami ("the Syrian") who taught Sufism in the town of Chisht, some 95 miles east of Herat in present-day western Afghanistan. Before returning to Syria, where he is now buried next to Ibn Arabi at Jabal Qasioun Shami initiated, trained and deputized the son of the local emir, Abu Ahmad Abdal. Under the leadership of Abu Ahmad’s descendants, the Chishtiya as they are also known, flourished as a regional mystical order. The founder of the Chishti Order in South Asia was Moinuddin Chishti. He was born in the province of Silistan in eastern Persia around 536 AH (1141 CE), into a sayyid family claiming descent from Muhammad. When he was only nine, he memorized the Qur'an, thus becoming a hafiz. His father died when he was a teenager; Moinuddin inherited the family grinding mill and orchard. He sold everything and gave the proceeds to the poor. He traveled to Balkh and Samarkand, where he studied the Qur'an, hadith, and fiqh. He looked for something beyond scholarship and law and studied under the Chishti shaykh Usman Harooni. He moved to Lahore and then to Ajmer, where he died. His tomb, in Ajmer, is the Dargah Sharif, a popular shrine and pilgrimage site. Nizamuddin Auliya - This branch became the Chishti Nizami branch. Alauddin Sabir Kaliyari - This branch became the Chishti-Sabiri branch. Later, yet other traditions branched from the Chisti lineage; in many cases they merged with other popular Sufi orders in South Asia. As a result of this merging of the Chishti order with other branches, most Sufi masters now initiate their disciples in all the four major orders of South Asia: Chishti, Suhrawadi, Qadri, and Naqshbandi. They do however, teach devotional practices typical of the order with which they are primarily associated. The Chishti order has also absorbed influences and merged at times with various antinomian fakir Sufi groups, especially the Qalandar. Some Chishtis both past and present have lived as renunciants or as wandering dervish. In more recent times, a more contemporary expression of traditional Chishti Sufi practices can be found in the establishment of the Ishq-Nuri Tariqa in the 1960s, as a branch of the Chishti-Nizami silsila. In addition, a number of pseudo-Sufi or mixed-Sufi type groups or movements in Islam, have also been influenced by the Chishti Order proper - the best known and most widespread example is of the Jamaat Ahle Sunnat, a Sunni Muslim sect with a huge international following, which is in essence not a proper Sufi organization though adopting many Sufi customs and traditions. Several rulers of the Mughal dynasty of South Asia were Chisti devotees. The emperor Akbar was perhaps the most fervent of them. It is said to be by the blessing of Shaikh Salim Chishti that Akbar's first surviving child, the future Jahangir, was born. The child was named Salim after the sheikh and was affectionately addressed by Akbar as Sheikhu Baba. Akbar also credited the Chisti sheikhs with his victory at the Siege of Chittorgarh. Akbar had vowed to visit the Chisti dargah, the tomb of Moinuddin Chishti, at Ajmer if he were victorious. He fulfilled his vow by visiting the dargah with his musicians, who played in honor of the sheikh. Shah Jahan's daughter, Jahanara Begum Sahib, was also a devout follower of the Chisti Order. 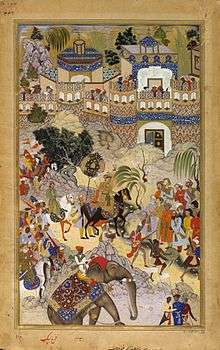 The passing of Shah Jahan; attending him, his daughter Princess Jahanara. 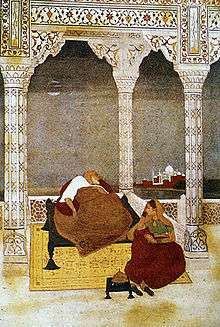 The Mughal Emperor Akbar was a great patron of the Chishti Order. ↑ Rozehnal, Robert. Islamic Sufism Unbound: Politics and Piety in Twenty-First Century Pakistan. Palgrave MacMillan, 2007. Print. ↑ Sufi martyrs of love By Carl W. Ernst, Bruce B. Lawrence, p. 4. ↑ Chishti, Hakim Moinuddin (1991). The Book of Sufi Healing. Rochester: Inner Traditions International. ISBN 0-89281-324-5. ↑ Sufi martyrs of love By Carl W. Ernst, Bruce B. Lawrence, p. 5. ↑ Nizami, K.A. "Čishtiyya." Encyclopaedia of Islam, Second Edition. Edited by: P. Bearman, Th. Bianquis, C. E. Bosworth, E. van Donzel, and W. P. Heinrichs. Brill, 2011. Brill Online. Augustana. 6 April 2011 <http://www.brillonline.nl/subscriber/entry?entry=islam_COM -0141>. ↑ Böwering, Gerhard. "Cestiya." Encyclopaedia Iranica. Online Edition. Vol. 5. 1992. Web. <http://www.iranica.com/articles/cestiya>. ↑ ORIGIN OF CHISHTIES. Retrieved August 15, 2008. ↑ The Sufis of Britain: an exploration of Muslim identity By Ron Geaves. Cardiff Academic Press, 2000, p. 87. ↑ Encyclopaedia of Indian philosophy, Volume 2 By Vraj Kumar Pandey. Anmol Publications, 2007, p. 78. ↑ Nizami, K.A. "Čishtī, Ḵhwādja Muʿīn al-Dīn Ḥasan." Encyclopaedia of Islam, Second Edition. Edited by: P. Bearman, Th. Bianquis, C. E. Bosworth, E. van Donzel, and W. P. Heinrichs. Brill, 2011. Brill Online. Augustana. 6 April 2011 <http://www.brillonline.nl /subscriber/entry?entry=islam_SIM-1623>. ↑ Haeri, Muneera. The Chishtis: A Living Light. Oxford University Press, USA, 2000. Print. ↑ Frembgen, Jurgin Wasim. Journey to God: Sufis and Dervishes in Islam. Oxford University Press, USA, 2008, pp. 94-95. ISBN 978-0-19-547642-2.